After 12 years of planning and running the Jennifer Widbur Memorial Hockey Tournament, event organizers have said this year's event will be the last one. It's not that they are giving up. In fact this tournament hosted by the Honeywood Hockey Moms has gone well above and beyond anyone's expectations when it began in 2008. The Tournament has raised over $500,000. That's an incredible amount of money for a small community, and they have made a difference in the lives of many people along the way. A main recipient of the funds raised was the Cancer Care Centre at the Headwaters Health Care Centre in Orangeville. 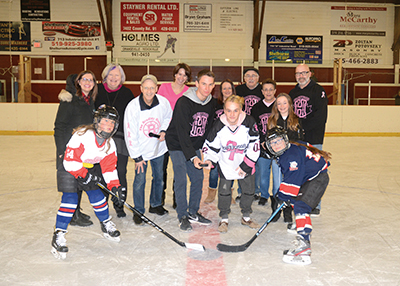 Over the years the Tournament has also contributed to Canadian Breast Cancer Foundation, helped fund minor hockey and contributed to several other local causes. Planning and running the Tournament requires a lot of work, and organizers decided that time had run its course for this particular event. This year's tournament had 15 teams entered in both a recreational and competitive division. While this annual tournament will not continue, Mr. deLatt said that if anyone else decided to pick up the torch and carry on, he would be happy to help them get started.